Professor of Classics Joe Day has been awarded one of two Whitehead Visiting Professorships at the American School of Classical Studies at Athens for the 2011/2012 academic year. The position, which includes a stipend, housing in Athens, and travel expenses, will allow the 28-year Wabash veteran teacher/scholar to continue his research on the Greek epigram and teach a seminar on the subject during the school’s winter term. Announced after a national search among more than 400 representatives from nearly 200 academic institutions, the award caps a stellar past two years for Day, who was named the Indiana Classics Teacher of the Year in 2009, earned the College’s top teaching award in 2010, and had his book, Archaic Greek Epigram and Dedication: Representation and Reperformance, published by the Cambridge University Press in November. “We look forward to having a scholar and teacher of Joe's reputation with us in Athens next year,” said the ASCSA’s director, Professor Jack L. Davis. “Joe Day will be able to incorporate work from his recent book in the subject of his seminar and offer a kind of expertise on Greek poetry and inscriptions that will provide excellent balance with that of the other faculty,” said Professor Mary Sturgeon, chair of ASCSA’s managing committee which oversees the professorships. The scholar and teacher plans to preliminarily investigate three larger-scale projects during his return to Greece, including the study of epigrams and dedication as they relate to fifth-century Athenian drama, and continuing to find and document in various locations throughout Greece further evidence of the ways that epigrams were read. Day is the second in his family to receive a Whitehead Professorship. 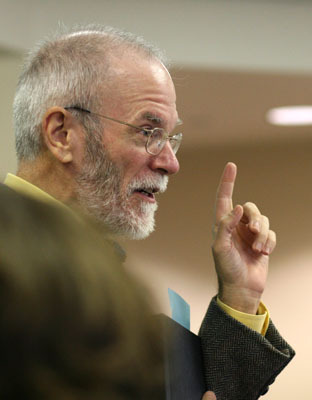 His wife, Wabash Professor of Classics Leslie Day, earned the award in 2005. Surprisingly, the Days are not the first couple in which both have been awarded these professorships “In fact, I know of at least one other couple, and they're good friends of ours,” Day said.